SpaceX's robotic Dragon cargo capsule splashes down in the Pacific Ocean west of Baja California on May 11, 2016. SpaceX's robotic Dragon capsule has come back down to Earth, wrapping up the company's latest cargo mission to the International Space Station (ISS) for NASA. The uncrewed Dragon spacecraft splashed down today (May 11) in the Pacific Ocean 261 miles (420 kilometers) southwest of Long Beach, California, at 2:51 p.m. EDT (1851 GMT), about 5.5 hours after undocking from the ISS, NASA officials said. The capsule came down with more than 3,700 lbs. (1,680 kilograms) of NASA cargo and scientific samples, including material from the one-year ISS mission recently completed by NASA astronaut Scott Kelly and cosmonaut Mikhail Kornienko, agency officials said. 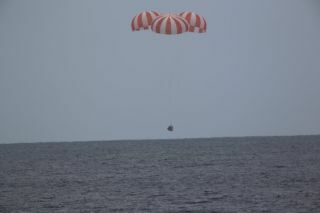 SpaceX personnel will recover Dragon by ship and then haul the spacecraft to Long Beach for processing. Dragon is the only robotic cargo vessel currently flying that's capable of bringing material safely from the ISS down to the ground. The other freighters — Orbital ATK's Cygnus spacecraft, Russia's Progress vessel and Japan's H-II Transfer Vehicle — are all designed to burn up in Earth's atmosphere and therefore are packed with garbage, not cargo, when they depart the orbiting lab. Dragon launched atop a SpaceX Falcon 9 rocket from Florida's Cape Canaveral Air Force Station on April 8, loaded up with nearly 7,000 lbs. (3,175 kg) of supplies, hardware, scientific experiments and other gear. During this launch, the first stage of the Falcon 9 succeeded in landing softly on a robotic ship in the Atlantic Ocean, marking the first time a booster had ever touched down on a ship at sea. Dragon reached the ISS on April 10. SpaceX has now flown a total of eight cargo missions for NASA (though the seventh, which launched in June 2015, ended less than 3 minutes after liftoff when the Falcon 9 broke apart). The next Dragon/Falcon 9 flight is scheduled to blast off from Cape Canaveral in late June.